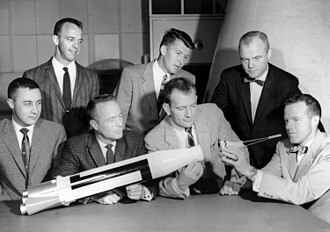 Created on November 5, 1958, the Space Task Group was headed by Robert Gilruth. Originally it consisted of 45 people, including eight secretaries and "computers", the occupational title for women who ran calculations on mechanical adding machines. 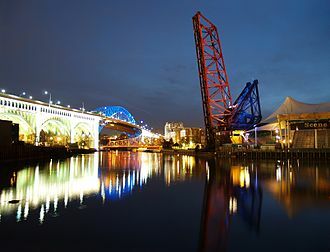 Of its 37 engineers, 27 were from Langley Research Center, and 10 had been assigned from Lewis Research Center in Cleveland, Ohio. Original members of the group included Charles Donlan, Gilruth's deputy; Max Faget, head of engineering; Chuck Mathews, head of flight operations; Chris Kraft, also in flight operations; and Glynn Lunney, who at 21 was the youngest member of the group. The head of the public affairs office was John "Shorty" Powers. 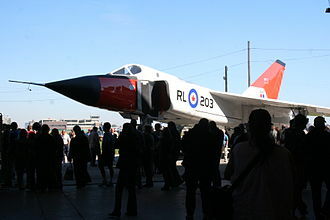 In 1959, the group was expanded by the addition of 32 engineers from Canada, who had been left without jobs when the Avro Arrow project was cancelled. These new engineers included Jim Chamberlin, George Harris, John Hodge, Owen Maynard, Bryan Erb, Rodney Rose, and Tecwyn Roberts. 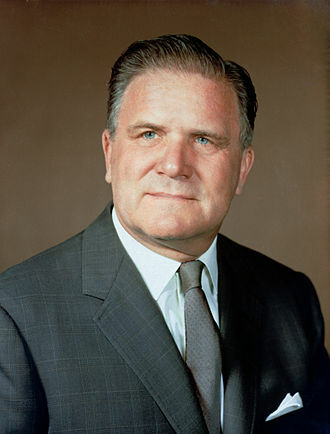 After President John F. Kennedy set the national goal on May 25, 1961, of landing men on the Moon by the end of the 1960s, it became clear to NASA administrator James E. Webb that Gilruth would need a much larger organization and facilities, in fact a new dedicated NASA center, to administer US manned space programs. 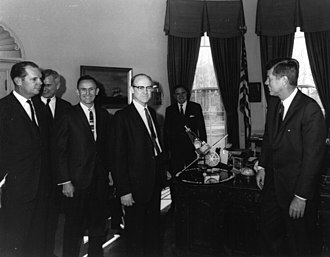 Webb got the approval of Kennedy, and the Congress, and in August 1961 appointed a team to select a site for the new center. On September 19, Webb announced the new Manned Spacecraft Center (MSC) would be built on a Houston, Texas site donated by Rice University. Gilruth immediately began the transition of his Task Group into the new MSC, planning his increased staff organization and its move to Houston, using temporary leased office and test facility space on 12 sites while the new facility was being built. By September 1962, his organization was moved to Houston and construction had begun, effectively marking the end of the Task Group. 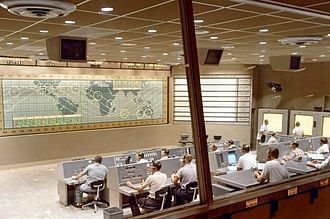 The MSC facility was completed in September 1963. The National Aeronautics and Space Act of 1958, which established NASA, also directed the President of the United States to chair a National Aeronautics and Space Council (later the National Space Council), including the Secretaries of State and Defense, the NASA Administrator, the Chairman of the Atomic Energy Commission, and any additional members that the president chose to appoint. This council was tasked with making recommendations on the direction of the US civilian and military space programs. Occasionally this council was referred to as a "Space Task Group". 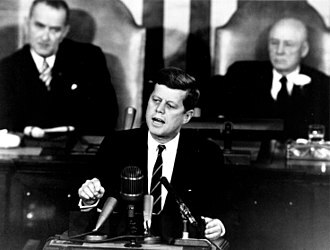 President John F. Kennedy persuaded Congress to modify the law to give him the authority to appoint the Vice President to chair the council in his place. As the Apollo program reached its climax in 1969, President Richard M. Nixon directed Vice President Spiro T. Agnew's "Space Task Group" to recommend a future direction of the US manned space program. Agnew enthusiastically supported an ambitious Space Transportation System program including reusable spacecraft, permanent Earth and Lunar stations, and human flight to Mars. However, Nixon knew the mood in the US Congress would not continue to sustain funding at the level of Apollo, and cut these plans back to only the development of the Space Shuttle, with possible eventual establishment of an Earth orbital space station. ^ Murray & Cox (1989), pp. 33-35. ^ Gainor (2001), pp. 270-276. Gainor, Chris (2001). Arrows to the Moon - Avro's Engineers and the Space Race. Burlington ON Canada: Apogee Books. ISBN 1-896522-83-1. Swenson, Jr., Loyd S.; James M. Grimwood; Charles C. Alexander (1989). This New Ocean: A History of Project Mercury. NASA. Archived from the original on 2007-08-23. 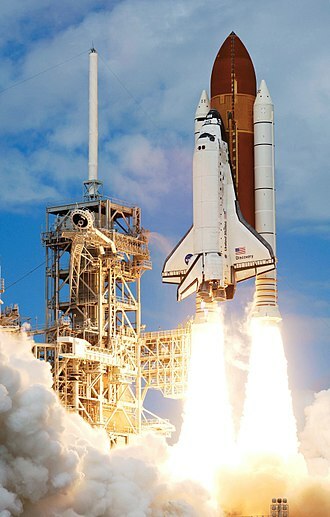 The Columbia Accident Investigation Board was convened by NASA to investigate the destruction of the Space Shuttle Columbia during STS-107 upon atmospheric re-entry on February 1,2003. The panel recommended changes that should be made to increase the safety of future shuttle flights, the CAIB released its final report on August 26,2003. The board found both the physical cause of the accident and what it called organizational causes. During re-entry into the Earths atmosphere, this damage allowed super-heated gases to enter and it was the seventh known instance of a piece of foam, from this particular area of the external tank, breaking free during launch. 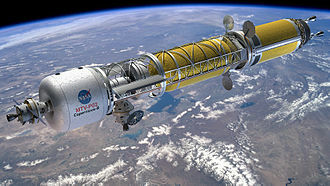 The problem of debris shedding from the tank was well known and had caused shuttle damage on every prior shuttle flight. 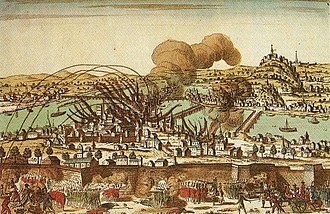 The damage was usually, but not always, over time, management gained confidence that it was an acceptable risk. NASA decided that it did not warrant an extra EVA for visual inspection, feeling that it would be like a car going down a highway, the board made 29 specific recommendations to NASA to improve the safety of future shuttle flights. Only two further Space Shuttle missions were allowed to be flown before the implementation of these recommendations, after the CAIB report came out, NASA implemented all recommended changes and flew its first post-Columbia mission in 2005. 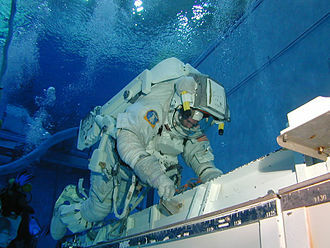 As part of the CAIB recommendations, the Shuttle carried a 50-foot inspection boom attached to the robot arm, NASA retired the Space Shuttle fleet on July 21,2011 after completing the ISS and the final flight and subsequent landing of Atlantis. The Shuttles replacement, was to have consisted of an Apollo-derived spacecraft launched on the Ares I rocket, Orion would not face the dangers of either an O-ring failure or shedding foam. In addition to ferrying crews to the ISS, the Orion spacecraft was to allow NASA to return to the Moon, chairman of the board Admiral Hal Gehman, USN Board members Rear Admiral Stephen Turcotte, Naval Safety Center Maj. General John Barry, Director and Programs, Headquarters Air Force Materiel Command Maj. General Kenneth W. Hess, Air Force Safety Center Dr.
Roberts served as NASA’s first Flight Dynamics Officer with Project Mercury that put the first American into space. Roberts, alternately nicknamed Tec and Tex, was born 10 October 1925 at Trefnant Bach cottage in Llanddaniel Fab, Anglesey and he received his early education at Ysgol Parc y Bont, the small local primary school there. He left the school in 1938 after a successful Scholarship Examination and continued his studies at the Beaumaris Grammar School, from which he graduated in 1942. After serving briefly in the Royal Air Force, Roberts was released in 1944 and resumed work with Saunders-Roe at their Southampton works, from where he was transferred to the Isle of Wight in 1946. At that time, he attended the University of Southampton where he obtained a degree in Aeronautical Engineering in 1948 and was awarded the Institute of Mechanical Engineers Special Award. Whilst working for Saunders-Roe on the Isle of Wight, Roberts met Doris Sprake whom he married, in December 1952, Roberts and his wife left England for Canada to take up a position with the aircraft manufacturing company Avro Canada near Toronto. From 1952 to 1959, he was a member of the team that developed the CF-105 Arrow. Of its original 37 engineers,27 were from Langley Research Center and 10 had been assigned from Lewis Research Center in Cleveland, Ohio. 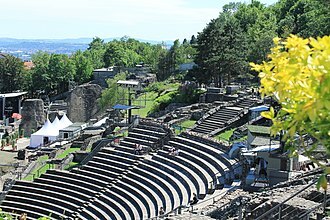 In 1959, Gilruths group was expanded by the addition of the engineers from Canada who had been left without jobs when the Avro Arrow project was cancelled. 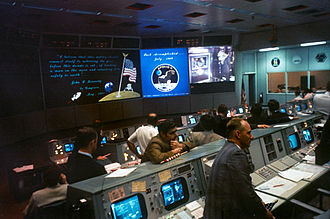 Roberts joined NASA in April 1959, one of a group of 25 engineers and he was involved immediately in formulating the requirements for the tracking and communications network, and the Mercury Mission Control Center to provide the flight control of the missions. In 1960, Roberts became NASAs first Flight Dynamics Officer at the Mercury Control Center, Roberts may have popularized the use of the phrase A-OK, making those three letters a universal symbol meaning in perfect working order. U. S. Air Force Lt. Col. John Shorty Powers popularized the expression while NASAs public affairs officer for Project Mercury, NASAs concept of Mission Control had previously been developed under the leadership of Christopher C.
The National Advisory Committee for Aeronautics was a U. S. federal agency founded on March 3,1915, to undertake and institutionalize aeronautical research. 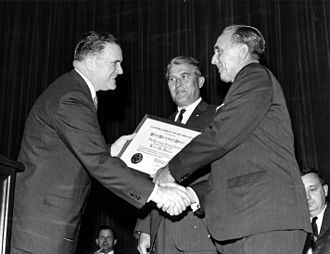 On October 1,1958, the agency was dissolved, and its assets and personnel transferred to the newly created National Aeronautics, NACA was pronounced as discrete letters, rather than as a whole word. 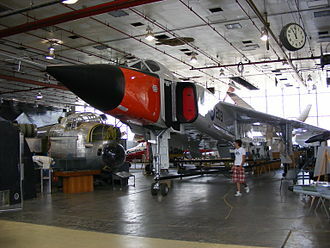 NACA was key in developing the area rule that is used on all modern supersonic aircraft and it was modeled on similar national agencies found in Europe. The most influential agency upon which the NACA was based was the British Advisory Committee for Aeronautics, in December 1912, President William Howard Taft had appointed a National Aerodynamical Laboratory Commission chaired by Robert S. Woodward, president of the Carnegie Institution of Washington. 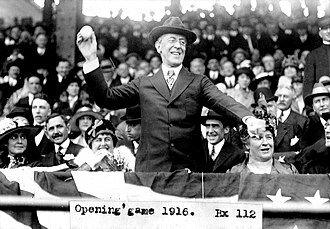 Legislation was introduced in both houses of Congress early in January 1913 to approve the commission, but when it came to a vote, assistant Secretary of the Navy Franklin D. Roosevelt wrote that he heartily the principle on which the legislation was based. Walcott suggested the tactic of adding the resolution to the Naval Appropriations Bill, according to one source, The enabling legislation for the NACA slipped through almost unnoticed as a rider attached to the Naval Appropriation Bill, on 3 March 1915. 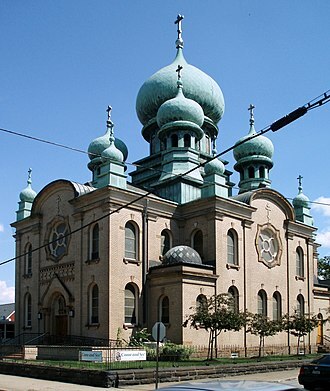 The committee of 12 people, all unpaid, were allocated a budget of $5,000 per year. President Woodrow Wilson signed it into law the day, thus formally creating the Advisory Committee for Aeronautics. 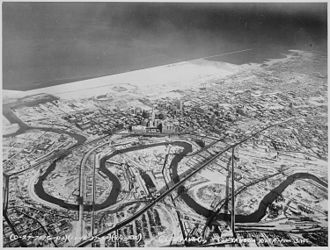 On January 29,1920, President Wilson appointed pioneering flier, by the early 1920s, it had adopted a new and more ambitious mission, to promote military and civilian aviation through applied research that looked beyond current needs. 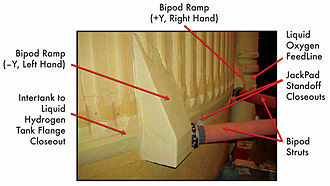 NACA researchers pursued this mission through the impressive collection of in-house wind tunnels, engine test stands. Commercial and military clients were permitted to use NACA facilities on a contract basis, facilities Langley Memorial Aeronautical Laboratory Ames Aeronautical Laboratory Aircraft Engine Research Laboratory Muroc Flight Test Unit In 1922, NACA had 100 employees. In addition to assignments, staff were encouraged to pursue unauthorized bootleg research. The result was a string of fundamental breakthroughs, including thin airfoil theory, NACA engine cowl, the NACA airfoil series. The full-size 30-by-60-foot Langley wind tunnel operated at no more than 100 miles per hour and these were speeds Lockheed engineers considered useless for their purposes. Arnold took up the matter and overruled NACA objections to higher air speeds, NACA built a handful of new high-speed wind tunnels, and Mach 0.75 (570 mph was reached at Moffetts 16-foot wind tunnel late in 1942. In the years immediately preceding World War II, NACA was involved in the development of designs that served key roles in the war effort. This enabled the B-17 to be used as a key aircraft in the war effort, the designs and information gained from NACA research on the B-17 were used in nearly every major U. S. military powerplant of the Second World War. 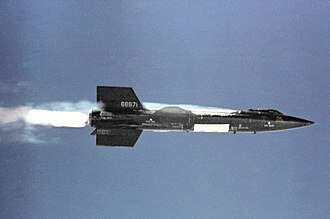 Nearly every aircraft used some form of forced induction that relied on information developed by NACA, because of this, U. S.
As a federal agency, the National Aeronautics and Space Administration receives its funding from the annual federal budget passed by the United States Congress. The following charts detail the amount of federal funding allotted to NASA each year over its past fifty-year history to operate aeronautics research and manned space exploration programs. Seen in the year-by-year breakdown listed below, the amounts that NASA has been budgeted from 1958 to 2011 amounts to $526.178 billion—an average of $9.928 billion per year. By way of comparison, total spending over this period by the National Science Foundation was roughly one-fifth of NASAs expenditures, $101.5 billion, or $2 billion a year. Notes for table, Sources for a part of data, U. S. Office of Management and Budget, Air Force Associations Air Force Magazine 2007 Space Almanac Secondary references. CS, Year 1959-1968, 1989-1996, NASA Pocket Stats, http, CS, Year 1993-2011, Workforce Information Cubes, https, //wicn. nssc. nasa. gov 8. Contractors,1969, http, //history. nasa. gov/SP-4102/ch5. htm NASAs budget peaked in 1964-66, the agency was building up to the first moon landing, the Apollo program involved more than 34,000 NASA employees and 375,000 employees of industrial and university contractors. In March 1966, NASA officials told Congress that the 1959-72 run-out cost of the Apollo program would be an estimated $22.718 billion, the total cost turned out to be between $20 and $25.4 billion in 1969 dollars. 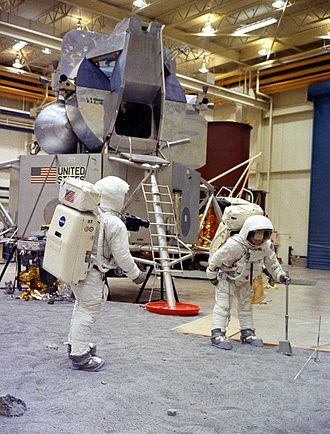 The costs of the Apollo spacecraft and Saturn rockets came to about $83 billion in 2005 dollars, Apollo spacecraft cost $28 billion, including the Command/Service Module, $17 billion, Lunar Module, $11 billion, and launch vehicles. The discounted rate of return for investment will have been 33 percent. A1992 commentary in the British science journal Nature reported, The economic benefits of NASAs programs are greater than generally realized, the main beneficiaries may not even realize the source of their good fortune. Only a scaled-back Space Shuttle was approved, and NASAs funding leveled off at just under 1% in 1976, after a brief increase to 1. 01% in 1992, it declined to about 0. 49% in 2013. The American public, on average, believes NASAs budget has a larger share of the federal budget than it actually does. It is estimated that most Americans spent less than $9 on NASA through personal income tax in 2009, there has been a recent movement to communicate discrepancy between perception and reality of NASAs budget as well as lobbying to return the funding back to the 1970-1990 level. The United States Senate Science Committee met in March 2012 where astrophysicist Neil deGrasse Tyson testified that Right now, to help with public perception and to raise awareness regarding the widespread benefits of NASA-funded programs and technologies, NASA instituted the Spinoffs publication. According to the NASA Spinoff about page the technologies in these reports created interest in the technology transfer concept, its successes, the reports generated such keen interest by the public that NASA decided to make them into an attractive publication. Thus, the first four-color edition of Spinoff was published in 1976, in the 2010s conservatives have opposed the earth science aspects of NASA spending. John Anthony Powers, better known as Shorty Powers, was an American public affairs officer for NASA from 1959 to 1963 during Project Mercury. A U. S. Air Force lieutenant colonel and war veteran, he was known as the voice of the astronauts, the voice of Mercury Control, and he received his nickname for his 5-foot, 6-inch height. Powers was born August 22,1922, to first generation Welsh immigrant parents in Toledo, Powers fathers last name was actually Power, upon signing the immigration documents, Power became Powers. 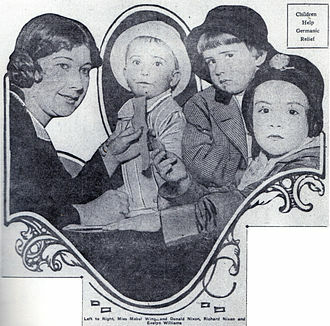 When Powers was an infant his family moved to Downers Grove, Illinois where he was a cheerleader at Downers Grove North High School, from which he graduated in 1941. After graduation, he enlisted in the U. S. Army Air Corps in 1942 and became a C-46, Powers left the service in January 1947, but was recalled to active duty in December 1948 and flew as part of the Berlin Airlift, making 185 round-trip flights. He volunteered for the Korean War and he flew 55 night missions in B-26 bombers with the 13th Bombardment Squadron and received the Bronze Star Medal, the Air Medal, the Distinguished Flying Cross and a combat promotion to Major. Following Korea, Powers bounced around the Air Force, helping establish the first Community Relations Program in 1955, Powers replied, in part, Were all asleep down here, which made headlines. He served as commentator for the six manned Mercury flights. He claimed astronaut Alan Shepard first used the expression during his Freedom 7 flight, for example, he told reporters the day before Gus Grissoms flight that the astronaut had gone fishing that day and had cooked and eaten his catch, which would have violated his pre-flight diet. Powers objected to the HQ decision to release the missions 22-orbit flight plan in advance and he was succeeded by Paul Haney on September 1, and Powers soon resigned. Powers retired from the Air Force in 1964 and opened a public firm in Houston. He became part owner of KMSC-FM in Clear Lake, Texas and he served a spokesman for products including the 1965 Oldsmobile Delta 88, Carrier air conditioners, Triptone motion sickness pills, and Tareyton cigarettes. He lectured extensively about the program, and in 1967, he authored a newspaper column syndicated by Field Enterprises called Space Talk. William Marsh Rice University, commonly referred to as Rice University or Rice, is a private research university located on a 295-acre campus in Houston, United States. 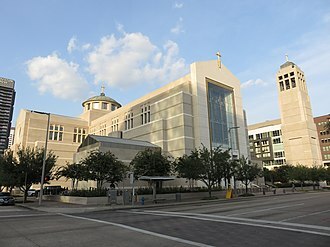 The university is situated near the Houston Museum District and is adjacent to the Texas Medical Center, Rice is generally considered the top university and the most selective institute of higher education in the state of Texas. 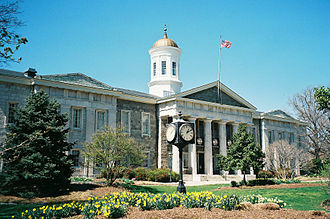 Opened in 1912 after the murder of its namesake William Marsh Rice, Rice is now a university with an undergraduate focus. Its emphasis on education is demonstrated by a student body and 6,1 student-faculty ratio. The university has a high level of research activity for its size. Rice is noted for its science programs in the fields of artificial heart research, structural chemical analysis, signal processing, space science. It was ranked first in the world in materials science research by the Times Higher Education in 2010, Rice is a member of the Association of American Universities. Graduate programs are offered through the Jesse H.
Jones Graduate School of Business, School of Architecture, Shepherd School of Music, Rice students are bound by the strict Honor Code, which is enforced by a student-run Honor Council. Rice competes in 14 NCAA Division I varsity sports and is a part of Conference USA, intramural and club sports are offered in a wide variety of activities such as jiu jitsu, water polo, and crew. In 1891, Rice decided to charter a free-tuition educational institute in Houston, bearing his name, to be created upon his death, Rices will specified the institution was to be a competitive institution of the highest grade and that only white students would be permitted to attend. 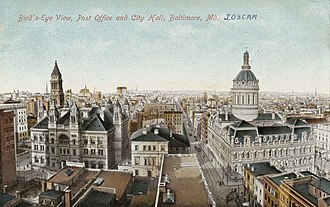 On the morning of September 23,1900, age 84, was dead by his valet. Shortly thereafter, a large check made out to Rices New York City lawyer. The lawyer, Albert T. Patrick, announced that Rice had changed his will to leave the bulk of his fortune to Patrick, rather than to the creation of Rices educational institute. 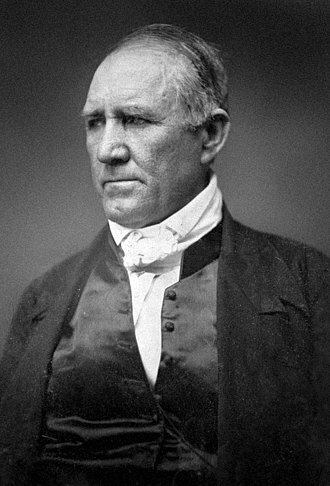 Rices friend and personal lawyer in Houston, James A. The Vision for Space Exploration was a plan for space exploration announced on January 14,2004 by President George W. Bush. 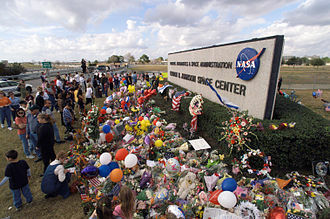 It was conceived as a response to the Space Shuttle Columbia disaster, the state of human spaceflight at NASA and it was replaced by the space policy of the Barack Obama administration in June 2010. 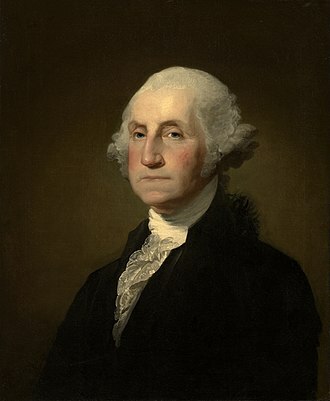 S. Outlining some of the advantages, U. S. President George W. NASA has outlined plans for manned missions to the far side of the Moon, all of the Apollo missions have landed on the near side. Unique products may be producible in the nearly limitless extreme vacuum of the surface. The Moon would become a proving ground toward the development of In-Situ Resource Utilization, the NSS believes that the Moon may be a repository of the history and possible future of our planet, and that the six Apollo landings only scratched the surface of that treasure. For example, Rep. Dave Weldon said, I think this is the best thing that has happened to the program in decades. Throughout much of 2004, it was whether the U. S.
Congress would be willing to approve. However, in November 2004, Congress passed a bill which gave NASA the $16.2 billion that President Bush had sought to kick-start the Vision. According to then-NASA chief Sean OKeefe, that spending bill “was as strong an endorsement of the space exploration vision, as any of us could have imagined. ”In 2005, Congress passed S.1281, the NASA Authorization Act of 2005, which explicitly endorses the Vision. NASAs Lunar Architecture forms a key part of its Global Exploration Strategy, the first part of the Lunar Architecture is the Lunar Reconnaissance Orbiter, which launched in June 2009 on board an Atlas V. The preliminary design review was completed in February 2006 and the design review was completed in November 2006. An important function of the orbiter will be to look for evidence that the increased concentrations of hydrogen discovered at the moons poles is in the form of lunar ice. After this the flights will make use of the new Ares I. However, VSE itself is poised to propel a host of beneficial Moon science activities, including lunar telescopes, selenological studies, with or without VSE, human spaceflight will be made sustainable. Jim Chamberlin was a Canadian aerodynamicist who contributed to the design of the Canadian Avro Arrow, NASAs Gemini spacecraft and the Apollo program. In addition to his air and space efforts, he is often cited as an example of Canadian brain drain to the U. S. He left NASA in 1970 and worked for McDonnell Douglas, in their Houston offices, james Arthur Chamberlin was born in Kamloops, British Columbia on May 23,1915. Chamberlin began his career with the British aircraft company Martin-Baker before returning to Canada. His longest tenure began as an engineer at Noorduyn Aircraft in Montreal, working on the Norseman. 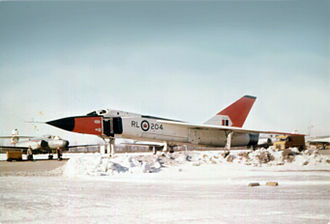 Later, as chief of design for the CF-105 Avro Arrow jet interceptor. 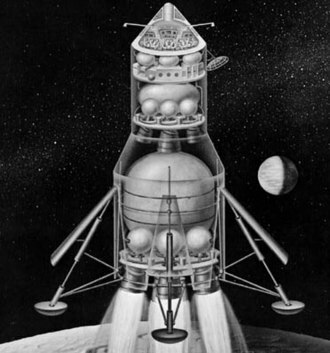 Following the Canadian governments cancellation of the Avro Arrow project in 1959, while designing the Gemini spacecraft in 1961, Chamberlin proposed that Gemini be paired with a “bug” that would land a single astronaut on the Moon. Chamberlin had been impressed with NASA engineer John Houbolt’s advocacy of Lunar orbit rendezvous as the method to go to the Moon, Chamberlin was described by space historian David Baker as “probably one of the most brilliant men ever to work for NASA. Apollo Road - The road to Honeysuckle Creek.